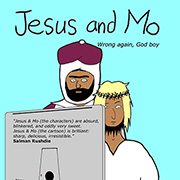 Jesus and Mo will be back next year. Are you being sarcastic here? Is your position ‘differences must be erased’? Sounds racist to me. If everyone in the world looks, talks, thinks, dresses, behaves exactly like you, wouldn’t the world be boring? Isn’t the staggering diversity of this world fun? Don’t attack diversity, in the name of attacking religion. And no, I am not religious. Don’t attack diversity in the name of attacking religion, sure. But also, don’t defend oppressive/dangerous practices in the name of defending diversity. The author is clearly advancing the latter admonition, not inviting the former. “Otherness” is simply a fact of human nature. Whoever we are, there will always be an “Other.” It’s something to integrate into our social relations, not something to obliterate or overvalue. It’s just there. Are humanists only to be found in the west? What is this about? Some kind of western macho mystic chest thumping? Or is it about values of humanism that is not about the west but about free thinking that can be found anywhere? Otherness is cool … to a point. After that, when faced with female circumcision, deranged Mahometans smashing up their own countries’ cultural heritages, or fundies of any stripe waging war on art, culture, science, and sexuality, we western humanists should have the cojones to get off our relativistic, self-loathing post-modernist arses and say “In this respect, we know we’re better”. I guess being against forced marriage, compulsory wearing of veils, stoning of adulterers etc etc etc is just racist isn’t it? I mean we would abhor that over here, but for *them* over there, well that’s just their culture isn’t it? Well, are you against compulsory removal of veils as practiced in the west also? Do you abhor that also? Do you abhor compulsion or do you abhor the veil? If you abhor compulsion and not the veil shouldn’t you allow voluntary wearing of the veil? If you abhor the veil and not the compulsion are you not racist? If you abhor both the compulsion and the veil what does that make you, how can you compel the removal of the veil if you abhor compulsion? No, I am not a muslim I don’t give a damn about the veil one way or the other, except that it should not be compelled to be worn or compelled to be removed. I can’t see that phrase, could you provide context? More or less sums up my position, but shouldn’t you also recognise the incidences of compulsion and consider to what extent you may be allowing compulsion? Shaihan did specify compulsory, and that compulsion is enforced quite brutally in some places. I am sure that in Europe and the States many women wear it voluntarily. To show their piety, to make a political statement, to hide from a confusing and frightening world with which they are not enabled to connect, to please their families, other reasons. Fine, of course. I’d no more object to that than to a slogan on a T-shirt. In some, because it is an old, unquestioned tradition. Fair enough, time will change as it does. But in some places, you wear it because you don’t want acid thrown in your face. So though I fully recognise and would defend the right to wear it, I don’t like it. Thanks Authors for some great laughs this year. A real quality output. I quoted a previous comment, but that comment has been moderated/removed… He said something about “we western humanists” being right and implied we easterners being wrong, though he didnt mention the east. I don’t remember his exact words. I dont like it either, but would defend the right to wear it, same as you. It is just like a man wearing a beard (he may do it for any number of reasons including religious compulsion like the sikhs), I find it difficult to distinguish between two bearded faces. But still I would defend the right to wear a beard. I don’t know why these should be a problem either. In India (the largest muslim country in the world) we have separate gyms/gym timings for women, separate swimming pools for women, even separate schools and colleges for women though co-ed gyms/pools/schools are also there. It is the choice of the women where they want to enrol. Whats the big fuss in giving women privacy if they want it and if there is a market to support it? It has nothing to do with religion. Here the veil is not an issue at all, though most muslim women do not wear it, but some do. Even some hindu and christian women wear the veil here. To put my argument for separate timings/places for women in a non-religious prespective: Though India is the largest muslim country in the world, muslims constitute only 13.2% of the population. Now the comment has reappeared again *after* my comment. Some crazy timing/cache problem I think? You are my hero. And I think you have the most intelligent commentators EVER. So intelligent and weighty I can’t be arsed half of the time to actually plough through their comments. But the toons still rock. As do you. Mightily. how do you feel about some other aspects of culture? Honor killings, for example. Should westerners accept these as appropriate, within the culture? A girl died recently in Canada because her dad allegedly felt her behaviour dishonored the family (the men?). She didn’t like to wear the hijab. Canada is multicultural, so should we give him a pass? I am against any sort of blood shed, even against killing animals for food. I am a pure vegetarian. And India is the worlds largest vegetarian country, so you know now to how much extent we abhor bloodshed. We were the first country to gain our independence through non-violence. dd this is not about you or what you perceive as your culture. This is about the “culture of human rights” btw. agreed by all memberstates of the United Nations Charta. Those rights are necessary because they allow us to practically manage modern (open) societies. The enemies of modernity and open societies dislike those rights, because their monopoly of power is threatened. They try protect their status via recursion on bronze age cults or via useful idiot proxy’s the cultural relativist sociology majors. I’m f.e. in favour of killing animals for food because I like to eat steak but I think we should not let them suffer or destroy the environment. Happy feasting to all of you. Diversity is what the world is all about, and i love every bit of it. As the saying goes “variety is the spice of life”. However, social responsibility is necessary too… as people and cultures are different, so are countries. Whatever country you live in, those are the laws you are required to obey… and in the case of the father in toronto, maybe disobeying your father is a justifiable reason to kill your daughter under the laws of another country, but not in Canada. Here it’s just murder. I was the one who said “western humanist”. My definition of that being anyone of any culture or ethnicity, anywhere in the world, who believes the value and truth of the western humanist tradition. There is no parochialism intended in the phrase. “A girl died recently in Canada because her dad allegedly felt her behaviour dishonored the family (the men?). She didnÃ¢â‚¬â„¢t like to wear the hijab. You imply that it is the easterners who live in canada who do such crazy things but crazy parents who kill their children can be found in the westerners group too. Do you want to give them a pass too? Crazy killer parents is not a problem unique to multi culturalism, don’t you think so? As for the dad in canada who killed his daughter, lock him up and throw away the key. Did you expect me to defend him just because he is a easterner? As far as I know there is no country where it is legal to kill your children. Do you know of any such country? Check out Deut. 18-23. Bible believers, if true to the Word, will sometimes kill their children, and be assisted by their neighbors. If the Bible was to be followed to the letter, then Christians would be as bad as radical Muslims. If Christians claim that the old law no longer applies because of the New Testament, then we have situational ethics. Also, if the laws of the OT are invalid, then the “Ten Commandments,” would be invalid as well. dd is such an angry fella, innit? Hindus didn’t gain independence from the Muslims who invaded India in the 8th, 10th, 11th and 12th centuries, did they? Did the Sepoy Mutiny unfold without bloodshed? Was the Partition of India, following the “peaceful” independence from the Brits, without bloodshed and slaughter? I wonder whether Gandhi would have been known to us westerners had he lived under the rule of Mughal Emperor Aurangzeb. Should dd want more western monsters to point at, he/she has to look no further than Armin Meiwes, the cannibal of Rotenburg, he’s gonna make you keck. Tell your friends! You are right, I just researched. Honor killing is a valid defence in many countries. The attitude that honor killing is right seems to have even appeared valid to a jury in ***Texas USA*** as late as ***1999***. yeah, helluva world, ain’t it? Strictly speaking, most of those countries make allowance for spousal killings by cuckolds. Often a hangover from the Napoleonic Code. Only the two I mentioned allow a man to kill any female relative, although it is not uncommon for tribal law to outweigh national prohibition and give de facto legal immunity. The distinction between so-called honour killings and the crazy parent killings you mentioned earlier is that ‘honour killings’ are condoned or approved by a large enough part of the killer’s community to allow them to feel moral and justified in their acts. yeah, helluva world! Let us hope that we modernize it atleast in this century. Come to think of it, craziness or insanity is also a valid defence to murder. So let us not allow them legal justification by calling them crazy, let us call them dangerous and perverted killers who should be locked up for life. Anywhere where the ten commandments are respected knows that ‘Thou shalt not kill.” Honour killings are wrong whatever the law of the particular land. It’s my understanding that ‘Thou shalt not kill’ is more properly translated as ‘Though shalt not murder’ in the sense of killing other than when sanctioned by religious or tribal beliefs. No religion has ever had a serious issue with justifying the killing of any number of category of people. Then why are you a non-vegetarian? (I assume you are). 3) Plants dont have blood, and I am not blood thirsty. 4) I dont like the thought of chewing on dead bodies. 5) As already told: I hate blood shed. 6) Plant food is more healthy. I just thought I should preach some of the humanistic eastern philosophies around here, since the topic is the east-west divide. We Indians have a terrible time finding good (=healthy vegetarian) food when travelling outside India. Nowhere does it say differences must be erased. In fact the statement means the complete opposite. Indonisia is generally recognised as the largest Muslim country. Though the thieves in the link are stealing useless bling. Maybe this particular toon was too deep for me. When the author uses prophet figures whom we are mocking to utter something, I thought the author is being sarcastic and supporting the reverse of what is uttered. It was my mistake in understanding. Yeah I found out Indonesia is the largest muslim country in the world. Though if you count pakistan and bangladesh which were part of India in the past, we are the largest. Maybe if the barmaid had said that then I would not have considered it sarcastic. So….. all this discussion on this page and 16 posts from you… is all because you thought the comic was saying the opposite of what it was saying? Well that makes sense…. or am I being ironic? On second thoughts, I still think the author was sarcastic and did mean the opposite of what was said. That is he meant differences must be erased. Though as one poster said “differences that cause oppression”. In that case it was “Last Hussar” who didnt get the point of this comic. As for 16 posts, I didn’t know you were setting any kind of limits on the number of posts here. Or don’t you like easterners commenting here, that you have got to pick on me. Or don’t you like discussion? Or don’t you like the points I make? Anyway the reason I think this toon got so many comments is because the next toon is not yet out. Quite, I’m pretty sure that the author was not calling for difference to be eradicated, but rather that ‘difference’ should not be fetishised and placed above human well-being. I am an hindu athiest, and I have never heard of a sittala devi. One thing that you should understand is that while the west is comparatively new and has only a single religion’s superstitions to undo, hinduism is a conglomerate of thousands of different beliefs. It is so decentralized that the thousands of different beliefs does not have one common thing except maybe karma (sanskrit for action/work, cause/effect not reincarnation). So we have tens of thousands of years of superstitions to undo. And not all parts of hinduism have the same superstitions. But since hinduism does not have a central book/prophet/god/city/meteorite holding back progress it can adapt very fast to modern times. It is just a question of how soon modern education spreads. That is there is nothing inherent in hinduism that objects to modern education, no central book which contradicts science and objects to a scientific outlook. I doubt whether a christian or a muslim or a jew can be an athiest. But hinduism has no objections with athiesm and no hindu will object to my being an athiest. In fact most hindus are athiests because they believe more in karma (cause/effect good actions produce good results etc) than in any god. Contrary to the belief that vaccines were invented in the west and then introduced to the east, it was the chinese who invented vaccination and the cult of sittala devi seems to be a variation of native innoculation practices, that has been superceeded by mass produced vaccines. It is well known that many vaccines produce a temporary fever and surely it is better to be temporary ill than to be healthy but in danger of being terminally infected? Yes, and an effective vaccination programme will be aware of temporary side effects. I don’t think we disagree. I am familiar of the origins of vaccination, but the situation today is that the ‘western’ model of medicine is better at preventing death than the ‘traditional’ model. Praying to a village godess will not save as many lives as an innoculation project. Isn’t it as foolish to assume that no tradition has any science behind it as it is to assume that all tradition has some science behind it? We have no problems in adopting ‘western’ model of discrete medicine (as attested by our increase in population numbers since independence). How do you know? This statement may be true NOW but it wouldn’t have been true just a hundred years back. For thousands of years innoculation has been administered under the guise of religion. It is only recently that science has become widespread. If you had tried to administer vaccines in the name of science a hundred years ago, you would have encountered tremendous opposition as attested by the fact that it was very difficult to introduce vaccination to the masses in the west until recently. But when science is disguised with religious mumbo jumbo it is (was) easy to get people to accept it. For example it seems ridiculous to westerners that hindus worship a elephant headed god. But consider the implication of worshipping a elephant headed god. When eco-friendliness is disguised as religion, elephants (in fact most other animals and trees) become a protected species (one that closely resembles man in temperament, life span, mind capacity etc). Elephant is the biggest land animal and hunting them is great prestige. But when protected by religion even ordinary villagers will oppose emperors in their hunting. In this decade ordinary villagers have been known to step in front of poacher bullets and get killed while protecting wild elephants and deers and other animals. While elephant has been wiped out in all continents (by rampant hunting by man, elephants are supposed to have existed even in north america till 1600s) it has survived in africa (because of forests impenetrable until the last century) and in south asia (because of religious protection). Sadly, though we indians protect the elephants with religion their numbers have dwindled to just 10,000 due to loss of habitat and in this century it is possible that the elephants both african and indian will become extinct. Anyway I think it is no more ridiculous to worship a elephant headed god than it is to worship a corpse hanging on a cross. No I don’t worship any god but I am just trying to explain the otherness of indian traditions with logic that you in the west will understand. If you have any other questions about indian traditions ask me and I will try to explain if they are not just superstitions. You don’t need to babble a whole story: sometimes absurd assumptions can have good results, like the nice story about the elephant or the science masked as mumbo jumbo. But the other side is also true: many people take absurd assumptions as carte blanche to kill others or believe mumbo jumbo masked as science. What the enemies of reason try is to “localise” modernity, to link it to a certain culture, the culture that first bear it, maybe. However this principles are universal because they stand for a new global social condition emerging also in India and other places. You are getting “westernised” (acctually modernised) in the way your societies are still backward and catch up. Nobody wants to take your traditions away if they don’t harm others, it just happens that they are out of date, get used to it: So It Goes. like you are linking modernity to westernization? I think he was trying to unlink it, dd. ‘Western’ is a misnomer which polarises issues unnecessarily. Even ‘modern’ carries certain harmful connotations. But as the scientific method (and the progressive world view it tends to engender) -regardless of its perceived geographical origin – continues to advance it will inevitably find itself in conflict with local traditional/religious practices. Sometimes there will be opposition from those who see one aspect being superceded as the whole culture being attacked. Not without historical justification perhaps, but isn’t it far more useful to incorporate demonstrably beneficial advances into the existing culture rather than try to preserve it as though in amber? Often there will be opposition by those whose grip on power is challenged by new ideas and new perspectives. And (the subject of this cartoon) relativist academics for whom perceived Otherness to the west is innately superior, regardless of practical results. Ironically, much of the pressure to replace older methods with effective clinics and health campaigns, to improve access to new ideas, and to actively promote a more positive role for women comes from members of these very communities working on the ground. It tends to be the comfortable academics who urge stasis and who would, no doubt have characterised opposition to human sacrifice as orientalist interference. By the way, are you the same dd who sometimes posts on Pickled Politics? If not you might want to check it out. Also Butterflis and Wheels, (linked to at the top). I think you would find them interesting. That is exactly what I am protesting here. Why equate scientific advancement with the west? Isn’t what science has become today the result of the efforts of the entire mankind? Where would computers be today if we Indians had not invented ‘Zero’? Imagine computers running on roman numerals I and II instead of 0 and 1. You say this because your only experience with religion has probably come from Islam and Christianity. They are like single person dictatorships (with a written book, things written down become resistant to change). On the other hand hinduism is like a multi party democracy, you can select your own ideas, gods, beliefs, prophets, hol(e)y books. Hinduism is very very open to change, in another 50 years we may have become very much more advanced than you while the west will STILL be debating evolution vs. intelligent design (a debate that doesn’t even occur here, just as there is and was no debate that the earth goes around the sun). No. I am very busy and usually I have time only for one forum at a time. I came to this site because I am a fan of cartoons. In fact dd stands for “donald duck” my favorite. My real name you can find in the linked website. I will, but wheres the link? “Hinduism is very very open to change” – well it has not been for several thousand years. As long as it was part a social condition combining agrarian subsistence economy with caste system and princedoms, there was virtually no change. This system gave food to a very small upper caste that every once in a while came up with a new spiritual concept that they could not (and did not want to) put into use. Than the English came and colonised the Indian principalities (brutally) and united it in a colony, building modern infrastructure, after this gained it’s independency (and split into a predominantely Hindu and Muslim part) there was sometimes some smart policy to modernise the (new-born) country. I truly hope you will be right that India will be “in another 50 years we may have become very much more advanced”. But this will be because you use modern methods and not the old, because you got rid of the traditions that hold you back and maybe put to use some traditions that are of use today, pluralism and creativity beeing some of them. Btw. I enjoyed reading your comments on blasphemy on your website, thanks for allowing me that. We have been colonized for a thousand years, first by the muslims and then by the britishers. (After independence we have become so good at science now that thousands of Americans come to India to get medical treatment because they can’t afford it in America. They say why pay huge sums to Indian doctors in America when you can pay low sums to Indian doctors in India. Perhaps you will be coming here too in your old age for medical treatment.) Do you want me to list the atrocities inflicted on India first by the muslims and then by the britishers (the westerners)? Do you want me to list the atrocities inflicted on China by Americans (feeding the chinese opium trade and cutting the chinese melon) and the Britishers and the Soviets? What will it take to make you give up your western chest thumping? Should we conquer you and subject you to colonization (infact we have already done that with our religions, most of the west is a slave to eastern religions, ha ha 🙁 and what can be worse than mental slavery? ) before you will acknowledge that the east is equally great? The Indian and Chinese civilizations were at their peak for thousands of years when the west was a mere backward cesspool under the dark ages. In fact it was the riches of India that led to the discovery of America and the emergence of Europe as a sea power. In their greed for the riches of India they had to make themselves sea worthy. India is the only country after which an ocean is named and the native Americans are called Indians testifying to this fact. Usually I don’t even call myself a hindu, I call myself only an atheist. Only when I am called on to defend the east I am forced to draw on the greatness of our past to counter your chest thumping. Do you think you are ever going to convert muslims to scientific mode of thinking if you keep insisting that the west is solely responsible for all scientific advances and is the sole custodian of free thought? The more you stress that progress lies in the west the more you are going to make them insist that their religion is just as great or greater, just as you have made me do here? Do you think you are winning friends and influencing muslims with an attitude like this? Don’t croon so much about western civilization, if you have asked the romans, the greeks, the indians, the chinese, the egyptians, they will tell you that once their civilization was also at the top but they all fell and yours will too it is just a matter of time if we go by the rise and inevitable decline of civilizations. Success leads to arrogance (like shown in this thread), and arrogance leads to failure. This shows how much ignorant you are about the caste system or about our history or about our science. Our astronomy could calculate the period of revolution of the sun (do you know how many years that is without looking it up now?) around the galactic center thousands of years ago while the west still believed that the sun went around the earth just a few hundred years back. Science is like a chain reaction. To reach critical mass takes a lot of effort. To invent the fire or ‘zero’ which you dismiss so lightly as of no consequence is the most difficult part. After critical mass is achieved later inventions become comparatively trivial because of the sustaining energy. Just because when science reached its critical mass when the west happened to have its turn at the top, don’t trivialize the enormous leaps that had to happen before. There are more scientists living today than all the scientists who have died. Thanks. In those comments no where have I mentioned that I am an hindu, but all those principles are the principles of hinduism. Freedom for blasphemy is a hindu concept that we have enjoyed for thousands for years, that the west is realizing just now. (A hindu can call any of his gods bad names and other hindus will not object. You can make any number of comics about hinduism and it will not offend me.) In fact the west doesn’t enjoy freedom for blasphemy even now because almost all the western countries including USA and UK have anti-blasphemy laws while India does not have an anti-blasphemy law. It is illegal to teach evolution in many American states. Shame! Shame! Wow. All this… Shows how difficult it is to accept each other’s otherness. yet when mr. J and mr. M want to say that all people deserve equal rights, the middle man does not like otherness any longer,and shows his true face of intolerance. A brilliant cartoon stripe, thanx, author! ..To respect others’ different ways of solving human issues, is a need the human race has, in order to create peace. What we choose to believe in, is a private matter,and should not be judged. No one is better or less worth than the rest, such thinking is a brain trick! Also, every person is born free. And should decide for her/him-self. Not be forced by others to obey their rules, out of fear from violence. is cowardice, lacing in empathy. We all know that torture is wrong. For everybody!!! It’s not ok in some places, because they call it their way. Common values do excist in the human race. Such as speaking one’s mind freely. And not being forced by violence. In our hearts we are a lot the same, us people. We cry, we laugh, we get angry. We want peace and joy. To be healthy, and live in love with friends and family. Those who don’t want these things, are hurt in some way or an other. No one is born bad. Upbringing brings out sides of our personalities. Violence begets violence. Nonviolence begets nonviolence. Each of us is one of us and one of them, an other to the other(s). Evil must excist in order for Good to excist. As without darkness we couldn’t speak of light. Anyways. A truely inspiring cartoon. I will check it out further. Cheers! I don’t understand why all this glorification of the own culture is necessary at all. Who cares which part of the world was once the greatest because it could do this and that – and which is now the “even more greatest” because it can do some other fancy stuff? If someone has a clever idea how to make the world a better place, does it matter in which country he/she was born hence which culture he/she “belonged” to? I think there are enough problems in understanding each other even without caring for unnecessary categories like eastern/western tradition or different countries – care for the things one does now and not what long dead people did. One thing we all share: we are humans. I don’t really have much to contribute. I have spent the last, gosh, I’m not sure, 30-40 minutes of my life reading this thread. Mel, you know your stuff, but you are arrogant. Don, i think you’re as conditioned as the rest of us but make a genuine attempt to overcome it, as I would hope to. dd, i started off thinking you were somebody who is so fucked up by envy and bitterness…and then I recognised myself. I am a native of a country that was colonised for centuries long before I was born. I’m an atheist too, of christian origin. I really don’t bear religion any ill will, because I was lucky. They didn’t hurt me. Despite your fairly emotional tirade, I think you’ve made some excellent points – the best of which is that the west is completely superior in it’s attitude, but the masochistic, martyr-struck indignation of many eastern and middle-eastern countries is equally unhelpful. The real way that the aggressor wins is that, long after they have released their physical grip on the victim, the victim is the gaolor, the torturer of themselves. The modern buzz-word for this might be having a ‘victim-mentality’. Don’t mean to be arrogant whacking a long post up here. have really enjoyed the discussion. It is frightening how afraid we are of each other. 60th comment….is this a record? So, in the interests of multi-cultural mutual respect should I give up beer because some other bugger’s favourite deity bans it or should they drink beer because my total lack of a deity finds it lovely? Personally, I think that on the whole, on average, in general and for the greater glory of a drunken party my morality should on several occasions prevail because mine does less harm (mostly) and encourages more besotted camaraderie. Mine leads to a softer, gentler, generally merrier world with fewer stonings and with those more often missing the target with ensuing gales of guffaws. Accepting every culture as tolerable and legitimate leads to many deep and valuable questions like this. Which is an interesting intellectual exercise but which gets in the way of having fun. Let’s face it, everyone should just convert to being English and have done with it all. Then the world would be just about perfect.